Kids are disgusting. They have no sense of hygiene and they chew their food into a sludgy mess then spit it into your hand. They also wipe snot from nostril to ear and they leave a crime scene in the bathroom. In fact, if you’re having kids, I recommend that you invest in some police tape to cordon off the bathroom after your preschooler has been in there – just to save guests from the unexpected horror. Here are 11 gross things I’ve had to clean because I have kids. I don’t know what my kids are doing back there, because to be honest, my eyes are on the road, but something pretty major is going on during the 10 minute school run. It’s like they get in and their pockets explode – every rock, ice block wrapper, piece of lint, dirt and half-sucked lolly comes flying out and embeds itself in the cracks in the car seats. And then there’s the half kilo of sand? In winter? When we haven’t been to the beach for six months? If you’ve ever had a toddler throw up in a car seat, you really know you’re alive. My eldest child once upchucked royally on a car trip to the airport. We stopped the car and while I was tending to my toddler by the side of the road, my brother-in-law cleaned up the entire thing with one single nappy wipe. ONE. I have never been so grateful to anyone. Ever. Poo on carpet is a special kind of hell you will enjoy when your toddler is toilet training. The higher the shag pile, the higher the trauma. The simple fact is, people with kids just shouldn’t have carpet, or rugs. There’s a special smell that permeates your bathroom if you have little boys and that smell is, PUBLIC URINAL. I have taken to keeping a cloth hanging on the towel rail so that I can simply wipe the seat clean EVERY SINGLE TIME I GO INTO THE BATHROOM. I call this cloth “the wee-wiper.” I wipe, rinse out the cloth, hang it out and it’s miraculously dry and ready for the next time I need it … which is usually about two hours later on the same day. The cracks in a high chair are a special place where disgusting things breed and grow. 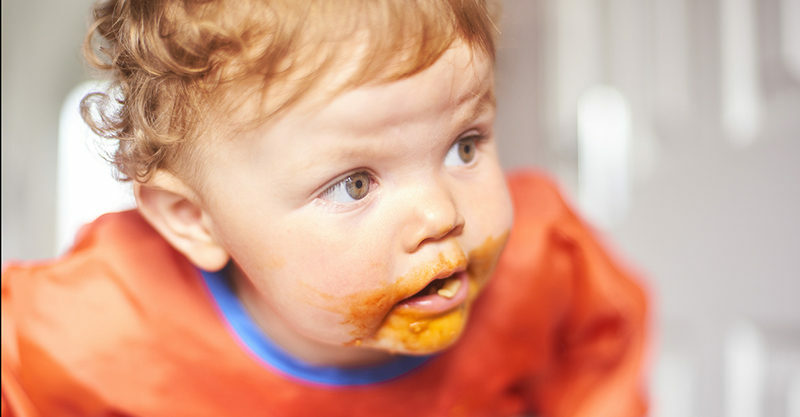 Whatever hasn’t made it into your baby’s mouth at mealtime along with some things that did make it and then came back out again, will lodge in every nook and cranny of the high chair seat. That’s why there’s only one kind of high chair you should buy: a high chair you can take outside and hose down. Preferably you should feed your baby out there too. While it’s true that you can clean these with a toothbrush and some disinfectant, I would not recommend it as a fun way to spend a morning. I only did it once and then could not face it again. Sweet bird of youth, the SMELL! It was reminiscent of wet dog mixed with old rope mixed with curdled milk. I feel faint just thinking about it. If you’re LUCKY you will have to clean this. Because if you’re lucky, you will know about it before your toddler flushes it away and blocks the sewer. And if you’re lucky again, you will find out about the flushing bit BEFORE the toilet backs up three weeks later and the plumber has to park a Portaloo in your front garden while they clear three weeks of backed up sewer. Oh yes, it happened. So if you find yourself cleaning a toy truck that dropped into the toilet, remember – YOU ARE LUCKY. It’s all fun and games when you hand your baby that ice cream and his eyes light up like a Christmas tree. Then comes the aftermath. The sticky aftermath of his first chocolate ice cream will be one of the first things that breaks you as a new parent. 9. The couch – behind it, underneath it, anywhere on it or around it. The most important piece of equipment you can buy when you are first having kids – second only to the cot and the pram- is a leather couch. Because you can wipe leather down. But the real test will be when you take the couch cushions off and see what has collected beneath. I call this place: The Underworld. Even more disgusting is the place BEHIND the couch where things like rusks, lolly wrappers and things you didn’t even know you fed your kids mysteriously migrate in large herds. Once your kids come of age and you can buy a nice upholstered couch, take that leather couch out the back and set fire to it. Ain’t nobody wants that thing, not even Vinnies. Here’s some advice, the first time your kid wets the bed, consider that mattress done and dusted. Because no matter how hard you wash and scrub, you’ll never be rid of the wee smell. You’ll think you’re rid of it and then it will heat up with your kid’s body and rise again. There is no cure for the mattress that was weed on back in 2013. Put it on the bonfire with the couch. If there’s a bad smell stalking your house – you know the one, it sort of comes and goes in wafts – the first place you should look is inside your child’s preschool bag. And when you find the source, when you find that putrid lunch box with its fermented banana and mouldy sandwich, do what I did: chuck that bag AND its contents out the window. No sense trying to save the bag, it’s beyond salvation. You know where to put it – on the bonfire with the couch and the mattress.